Tripp Lite's OMNI750ISO offers complete UPS protection with built-in line-interactive voltage regulation, intelligent monitoring and unattended shutdown capability. Built-in isolation transformer with faraday shield offers full isolation and complete common mode noise rejection. 750VA power handling capacity supports point-of-sale applications, computers, internetworking equipment and home theater systems during commercial power failures. Line-interactive voltage regulation corrects brownouts as low as 83V back to normal 120V levels, saving battery reserves for use only during complete power failures. Built-in USB communications port works with PowerAlert Software and cabling to provide automatic unattended shutdown of connected network and PC applications. Power problems—including blackouts, brownouts, power surges and line noise—can damage or destroy PCs and other expensive equipment, wipe out valuable data and files, and degrade component performance. Get protected against these all-too-common power threats with Tripp Lite’s OMNI750ISO Line-Interactive Tower UPS System. 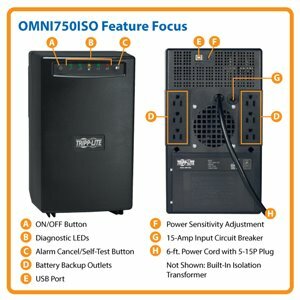 Featuring a built-in isolation transformer that delivers full immunity from electrical interference, distortion and line noise, 750VA/500W of battery backup capacity, automatic voltage regulation, surge suppression and 6 outlets, the OMNI750ISO is the complete power protection solution for high-end home theater systems, professional-grade computers, point-of-sale applications, telecom systems, diagnostic testing devices and other sensitive electronics. A HID-enabled USB port provides safe unattended system shutdowns and file saves during extended power failures. The OMNI750ISO comes with a 2-year warranty and $200,000 Ultimate Lifetime Insurance coverage for connected equipment (USA and Canada only). By isolating equipment from unpredictable and disruptive utility power, the OMNI750ISO eliminates the need for dedicated circuits or costly upgrades to your site’s electrical systems. A built-in Faraday Shield provides 100% isolation from the AC power line for sensitive connected equipment against EMI/RFI line noise, utility switching transients, background spikes and other unpredictable power conditions. Electrostatic discharge (ESD) resistance reduces potential static damage to connected electronics. UPS battery backup support lets you to work through short power failures and gives you enough time to save files and perform an orderly system shutdown in case of a prolonged blackout. The OMNI750ISO’s internal battery provides 31.3 minutes of battery support for a half load (250 watts) and 13.5 minutes for a full load (500 watts). During normal operation, incoming utility power keeps the UPS battery fully charged so that backup power will always be available when needed. Battery replacement is supported via the unit’s rear access panel. AVR protects your equipment from incremental hardware damage, data loss and performance problems that can be caused by low-voltage conditions (brownouts) and overvoltages. The OMNI750ISO automatically corrects brownouts as low as 81V and overvoltages as high as 143V back to 120V without drawing on battery power needed to support equipment through blackouts. A sudden power surge or spike can damage or destroy electronic components and wipe out irreplaceable data. The OMNI750ISO’s 510 joules of built-in surge suppression protects all connected components and the data they contain. The OMNI750ISO contains a HID-compliant USB port (USB cable included). When used with PowerAlert software (available for free download at tripplite.com), this USB port enables safe unattended system shutdown and file saves in the event of a prolonged power failure. The USB port also enables integration with built-in power management and auto shutdown features of Windows® and Mac OS® X. The OMNI750ISO’s space-saving, compact tower housing fits under a desk, on a shelf or almost anywhere. The OMNI750ISO can also be mounted on a wall using Tripp Lite’s UPSWM mounting bracket accessory (sold separately). The OMNI750ISO comes backed by a 2-year warranty and $200,000 Ultimate Lifetime Insurance coverage (USA and Canada only) for any connected components damaged by a power surge. The OMNI750ISO is also manufactured in compliance with strict RoHS guidelines to minimize the use of hazardous materials, and its replaceable internal battery is 100% recyclable.